Well, the weather is NOT very nice in Paris at the moment. It's been raining the whole weekend and continued today too. I really hope it won't rain tomorrow too! What have I been up to lately, then? I've actually continued beeing very cultural! 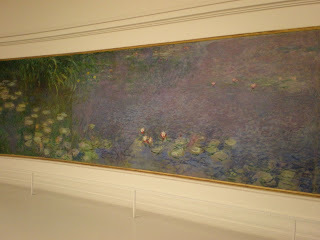 On saturday I went to see the famous big paintings by Monet at the l'Orangerie with the other foreign students. The paintings were really impressive! They covered the whole big wall! 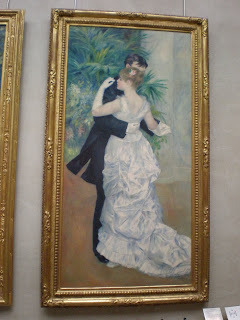 Then there were also these very lovely piano-paintings by Renoir. This is a part of one of the Monet paintings. Quite nice, isn't it? With us at the museum was also this Polish Erasmus-student and he had actually gone through the same thing as I did when I arrived! You know, with all the problems with the room. He also studies history here so it was the same coordinator who had erased him from the list! Even though he actually had gotten the confirmation letter, unlike me! And the worst thing of all was that at that point, there weren't any rooms left at this residence anymore, so he got a room at another residence on the other side of the town which will cost him 200€ more per month! Poor him! I just can't help wondering what the hell the coordinator has been thinking?! Is he bad at organizing or what? Really annoying. But it's good he found rooms for both of us anyway. I've also noticed that you should never be in a hurry over here, and you shouldn't either plan anything important after meeting other people. Because after you've done what you were supposed to do, you always have to go for a coffee afterwards. Actually a very sweet habit but also very expensive as it's not very cheap to go to a café here in Paris. I guess most of my money reserved for food will go to hot chocolates and tea! On sunday I met my old penfriend Rebecca here in Paris. That was very nice. We were walking around in Montmartre and also saw Moulin Rouge. And we talked french all the time, even though it would certainly have been much easier in english! But that was very good practise for me! And it actually felt much easier than usually since I was more relaxed and didn't worry so much about my pronunciation or if I used the right verb-form. As long as she understood what I wanted to say it was fine. 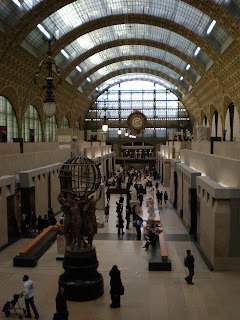 Afterwards I went to Musée d'Orsay with Sophie and the Polish guy, Marcin, to see more paintings and sculptures. But the museum over here are just so damn big that it's impossible to concentrate on everything. You just get so exhausted and in the end of the day everything just starts to spin around in your head. Musée d'Orsay from the inside. It's been a trainstation before and that's probably why there's a huge clock in the end of the hall. After all these museums we really didn't feel like visiting any today. The weather was really awful so me and Sophie decided to stay indoors instead. We went to a shop that sold DVDs really cheap and bought some films for only 3,50€ each! Then we came back to my place and watched a movie while drinking all together 1 litre of hot chocolate! Jami! That is what I call a perfect way of spending a rainy day! Ooooh, den där Renoiren är ljuvlig! Okej, de flesta är det, men speciellt den där!